Previous to the eleventh century there had been quarrels between Emperor and Pope. Occasional Popes, such as Nicholas I (858-67), had asserted high prerogatives for the successor of St. Peter, but we have seen that the Church herself taught the co-ordinate and the mutual dependence of the ecclesiastical and secular powers. It was the circumstances of the tenth century which caused the Church to assume a less complacent attitude and, in her efforts to prevent her absorption by the State, to attempt the reduction of the State to a mere department of the Church. 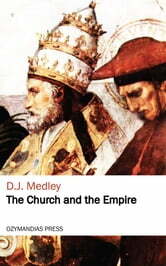 With the acceptance of Christianity as the official religion of the Empire the organisation of the Church tended to follow the arrangements for purposes of civil government. And when at a later period civil society was gradually organising itself on that hierarchical model which we know as feudalism, the Church, in the persons of its officers, was tending to become not so much the counterpart of the State as an integral part of it. For the clergy, as being the only educated class, were used by the Kings as civil administrators, and on the great officials of the Church were bestowed extensive estates which should make them a counterpoise to the secular nobles. In theory the clergy and people of the diocese still elected their bishop, but in reality he came to be nominated by the King, at whose hands he received investiture of his office by the symbolic gifts of the ring and the pastoral staff, and to whom he did homage for the lands of the see, since by virtue of them he was a baron of the realm. Thus for all practical purposes the great ecclesiastic was a secular noble, a layman. He had often obtained his high ecclesiastical office as a reward for temporal service, and had not infrequently paid a large sum of money as an earnest of loyal conduct and for the privilege of recouping himself tenfold by unscrupulous use of the local patronage which was his.